Ships from and sold by Book Outlet Canada. Between 1958 and 1962, 45 million Chinese people were worked, starved or beaten to death. Mao Zedong threw his country into a frenzy with the Great Leap Forward, an attempt to catch up with and overtake the Western world in less than fifteen years. It led to one of the greatest catastrophes the world has ever known. Dikotter's extraordinary research within Chinese archives brings together for the first time what happened in the corridors of power with the everyday experiences of ordinary people, giving voice to the dead and disenfranchised. This groundbreaking account definitively recasts the history of the People's Republic of China. Start reading Mao's Great Famine on your Kindle in under a minute. This was a very interesting book. It is well written and tells a story that few would know. This book is an excellent account of the Great Famine of China from 1958-62. The causes for the disaster are many, and they primarily come from the top-Chairman Mao, the communist dictator from 1949-76. Dikotter catalogues the natural disasters created by Mao’s dictates, ruinous agricultural practices directed by cadre acting on production quotas from top Communist Party leadership, deadly working conditions both for both rural and urban workers, and the inevitable violence against a people when you take their property, food, clothes, and livestock, leaving them to starve to death. The book is broken into several sections. The cost of collectivization and forced communal living is covered in the beginning chapters. The peasant’s land was taken, their houses were often torn down and used for fertilizer, and cooking pots and pans confiscated for steel production leaving a homeless and starving people. Even essential farm tools and grain for replanting were taken. Agricultural practices dictated from top Communist leaders and enforced by militia’s or cadres led to disastrous overplanting and overfertilizing, despite the farmer’s warnings. The result was poor crop yields and even top soil destroyed leading to not enough food to eat. Crops were taken from the rural areas and given to the cities. At a time when millions were starving, grain was being exported to pay for Mao’s military buildup. Livestock was devastated due to stables torn down for fertilizer, neglect, and disease. A culture of waste is well documented, as is an interesting relationship between the communist dictators Stalin, Khrushchev, and Mao. Along the way there are the manufactured enemies, political prisoners, Communist Party purges, and GULAGS, where the number of imprisoned and murdered were far less than their SOVIET counterparts. However, while the SOVIETS killed roughly 5-7 million in Ukraine famine under Stalin, 30-45 million were killed in Mao’s Great Famine. The horror of the famine is given over several chapters. From people eating leather, bark, thatch from roofs, cotton seed, and even mud to digging up bodies to eat and cannibalism. The extreme violence by cadres against the people is also covered. Here is the clear danger of a government-controlled economy where insufficient food, shelter, and clothing leads to death, and enforcement of totalitarian policies are accomplished against a mostly unarmed populace. Where unmet unrealistic quotas from agricultural and industrial goods hold dire consequences to local officials, the result is inflated and inaccurate figures, corruption, stealing, and both natural and economic disasters leading to the deaths of millions and the destruction of morality. Families were likewise destroyed, as millions of men relocated to the cities for work, and women were left to care for the children. Elderly could often no longer be cared for by families now fragmented and in this climate of every person for themselves. Starvation destroyed rural communities. Sexual and physical abuse by cadets occurred often. Much space is given to the sources and the accompanying problems in determining the exact number of dead due to the famine. While the sources are well documented, the difficulties inherent in a closed society, where information is hidden and distorted for propaganda purposes, are quite apparent. 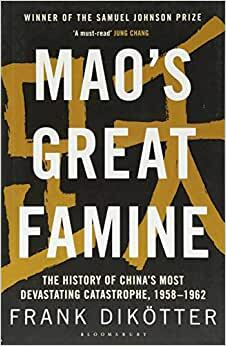 Whether there were 45 million dead due to Mao’s famine, as the author and others propose or not, Dikotter makes a good case for there being more than the 30 million estimated using the Statistical Yearbook. He outlines three other sources not used in the yearbook in which one member places deaths at 43-46 million due to the underreporting of deaths in rural areas and the subsequent 1979 study produced but not published. Two similarities struck me between the communist dictatorships of the SOVIETS and Communist Chinese. The Russian communists had a common saying: “If you are not stealing from the government, you are stealing from your family.” I saw the humor in it, and now I see the truth in it. Dikotter demonstrates again and again how the same government who took everything from the people now forced them to “steal” from the government for mere survival. Many examples were given: whether through simply eating raw grain that they grew, forging figures of goods produced, robbery, or even saving enough grain to replant next year’s crops. The responsibility for the deaths caused by the communist dictators—Stalin and here Mao—was excused by the citizens. Granted, there was no free press and little information distributed that was not propaganda. Moreover, blaming either could have meant a membership in GULAGS or their Chinese equivalent. However, there was a widespread, prevalent view that Mao (or Stalin) did not know what was going on in the communities, and presumably if he knew he would not agree or allow it. Yet, these very same totalitarian and draconian policies that led to such disasters came from these same two dictators. While quotas created an environment rife with inflated figures, Mao was warned about this, yet he chose to discard it. After all he was responsible for the policies; he was the dictator in charge of the policies leading to the Great Famine. I have family that lived through the period, and I have studied China all of my life, but in all that time only Dikotter has managed to bring the calamity to life in a visceral narrative that is at turns startling, enraging, numbing, and ultimately heartbreaking. The Great Leap Forward and the famine that followed brought out the very worst in China and in man, and serves as a potent reminder of why so many in China fear instability above all else. You don't have to read the book's prequel, "The Tragedy of Liberation," but if you binged on that first, then this one, you will find yourself with a profound insight into both the history of modern China and the psyche of its people. This is the first of Dikoetter's Mao trilogy. However for a chronological history I suggest you read "The Tragedy of Liberation". Dikoetter does for Mao what Robert Conquest did for Stalin - tell the truth. Or at least as much can be attained from limited documentation. As the author explains central government and Communist Party archives are not open to scholars or journalists. However, provincial records are available in some provinces and quite a bit of data can be pieced together from them. , Some of the documentation is available is simply from the the bureaucratic practice of making many copies and sending them to the provincial cadre leadership. While there is plenty of room for debating interpretation of the data, the debate appears to be confined to whether 45+ million dies or "merely" 20-25 million. It would seem that Mao was a genius at attaining and keeping power. At running a country not so much. The question that remains in my mind is did he actually comprehend the disaster that he created or it's scale? Even if he did, did he care? Did he think it mattered? A poignant account is when Liu Shaoqi who had devoted decades of his life loyally supporting Mao, the Party and the socialist dream comes to realization of what he has inflicted on the Chinese people. Unlike others he spoke up about it and paid the price. Beware: after reading this the next time you see someone on the street wearing a Mao t-shirt you won't feel the same. This is a very hard read as the subject is about Mao's descent into being history's greatest mass murderer with the dubious credit of having been responsible for the deaths of some 42,000,000 of his own countrymen, women and children. His early aide Li Shaoqui must share some of the blame but since Mao was able to even terrify China's well balanced and excellent diplomat, Zhou en Lai, China premier, into almost endless bouts of inane self criticism. The story is tragic and the figures of the dead place him above even Stalin and Hitler by many millions of deaths. What he did to China should never be forgotten and must be taken into account when we, in the west, try and judge China's current leaders against their precursors. Personally I was fascinated by a minor issue: the allegation (that could lead to the accused'd death) that he was a promoter of "splittist tendencies". The phrase was a new one for me but its absurdity belies its viciousness wehn hurled about by Mao, who really was a monster on a grand scale.